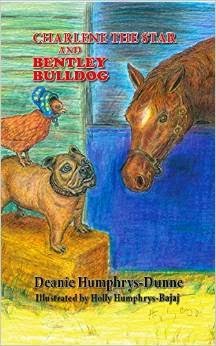 Deanie Humphrys-Dunne has a new book out called Charlene the Star and Bentley Bulldog. Like all of Deanie’s books it is a good book for children filled with wonderful lessons that are presented in a way that is still entertaining. As always, the illustrations are wonderful. You can purchase a copy here. Enjoy! Just went to check it out on Amazon. It's great that it's a series. Congrats to Deanie. and best of luck to you! Thank you M.J. I know Deanie appreciates all the support. Bentley Bulldog - I like the name. Deanie did do a great job. The name does fit. Thanks Murees for the lovely review of Bentley Bulldog! Holly and I also appreciate the kind comments from M. J. and Alex. My sister designed the cover as well as the illustrations. She's an amazing artist! Deanie always has good books with life lessons. I'm sure this one is no exception. Deanie does write great books. Thank you Sherry and Murees! We appreciate your kind words. Agreed. Deanie and her team did a great job. A lovely cover. Good luck to Deanie! Always good to get a good book rec! thanks!! Thanks for your kind words, everyone. Charlene the Star and Bentley Bulldog is now out on Kindle too! Her covers are always so appealing! Me and my sisters still have all our picture books from when we were kids. Enjoy stockpiling those new books.